How Modbus use in a network? Modbus is the network protocol.most of industrial application used today. It is Free universal open protocol. Modbus has been around industries for over 40 years. New Automation industrial product also comes with Modbus protocol.there are so many other Protocol also available. But Modbus is still preferred protocol. Modbus is a client/server architecture where a client will request data from the server. 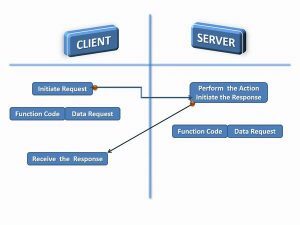 the client can also ask the server to perform several actions. The client generates or used function code. Communication in Modbus network the protocol determine each server(Controller) all known Client(device address), recognize message address to it determine the kind of action to be taken and extract any data or other information contained in the message. Message exchanged between the client and server is called Frames. ADU=>It’s little more complex ADU Contain Additional Address and Error Checking. 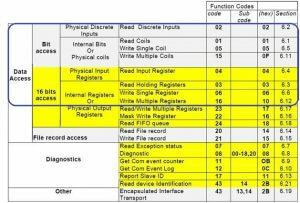 Set of action like reading & Writing here that is describe 4 Data Format Shown below……. How Modbus use in a network ? Modbus is a serial communication protocol. originally developed by Modicon in 1979. 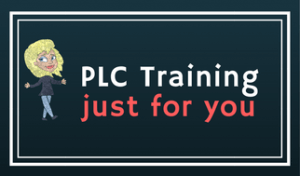 Use with Modicon PLC. Modbus is a very simple protocol. Modbus protocol also defined as a master-slave protocol. means device operating as master will poll one or more device operating as slave.master user read data from slave device register. master user Write data from slave device register. In Modbus protocol one master communication with many devices.Approx 240 device. Here describe a difference between Modbus ASCII VS Modbus RTU VS Modbus TCP/IP below. Modbus was originally developed ASCII Character to decode a message. This version is still used today. Modbus RTU and Modbus ASCII two modes incompatible to each other. 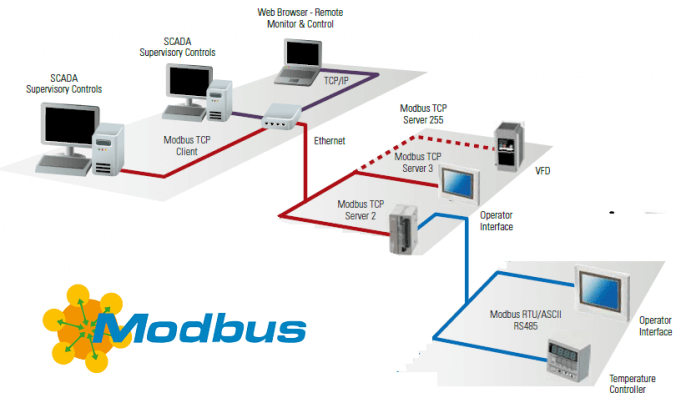 In Modbus TCP/IP used Modbus Server & Modbus Client Network. any Modbus device connected switches or series of switches. In RS232 Simple point to point arrangement. To connect more than two devices and distance is greater than 50 feet you should use RS485 or RS422. In that media, master communicates with multiple slave device.RS485 is by far most popular and support up to 32 nodes over the range 4000 feet. Modbus is simple to implement for device vendors. Modbus is open protocol so It doesn’t require a specific Media or Physical Layer, unlike many proprietary protocols, so Modbus networks are built on cheap and common infrastructure such as RS485, RS422, RS232, Ethernet links.